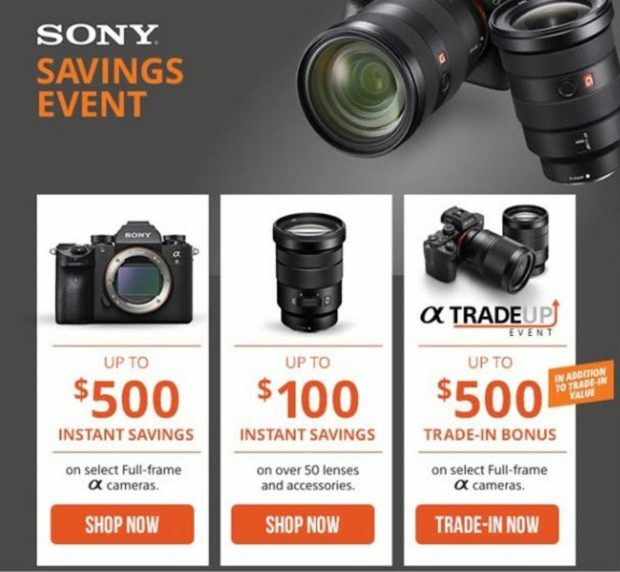 Up to $500 Off Sony Instant Rebates & Up to $500 Trade-in Bonus Now Live ! Sony has just released a new instant rebates on Sony Alpha mirrorless cameras and Sony lenses, you can save up to $500 off at Adorama/B&H Photo Video/Amazon. Author adminPosted on February 3, 2019 Categories Sony Deals, Sony E-mount Camera, Sony E-mount LensesTags Sony a7R III Bundle Deals/Cheapest Price, Sony Alpha a7II, Sony Alpha a7R II, Sony Alpha a9 Deals/Cheapest PriceLeave a comment on Up to $500 Off Sony Instant Rebates & Up to $500 Trade-in Bonus Now Live ! First $200 Price Drop on Sony a7 III Coming This Sunday ! Update: Price drop for Sony a7 III is not available yet ! Stay tuned when available. On this Sunday, February 3rd, Sony will release a new rebates on Sony Alpha mirrorless cameras and lenses. The very popular Sony a7 III will first time get $200 price drop, with new price at $1798 at Adorama, B&H Photo Video, Amazon.com, Focus Camera (Not Live yet). Author adminPosted on February 2, 2019 March 27, 2019 Categories Sony Deals, Sony E-mount Camera, Sony E-mount LensesTags Sony a7 III Deals/Cheapest Price, Sony a7R III Bundle Deals/Cheapest Price, Sony Alpha a9 Deals/Cheapest Price, Sony FE 70-200mm f/2.8 GM OSS LensLeave a comment on First $200 Price Drop on Sony a7 III Coming This Sunday ! A trusted source told us that Yongnuo is going to release their first E-mount/FE-mount lenses in 2020. Sony FE 16-35mm f/2.8 GM Lens Firmware Update Ver.03 Released ! 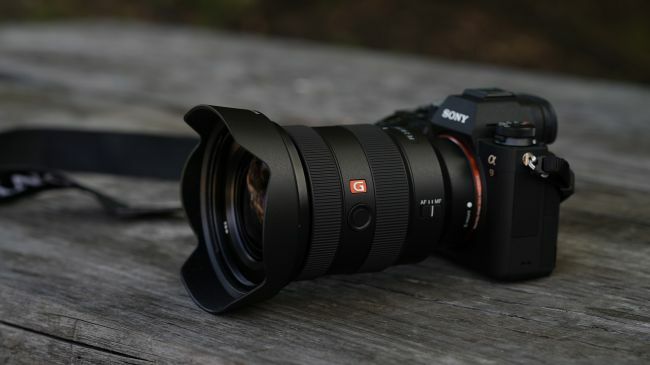 Sony has just released a new firmware update Ver.03 for FE 16-35mm f/2.8 GM Lens. You can download this firmware update here. Author adminPosted on January 30, 2019 Categories Sony E-mount LensesTags Firmware, Sony FE 16-35mm f/2.8 GM LensLeave a comment on Sony FE 16-35mm f/2.8 GM Lens Firmware Update Ver.03 Released ! Tamron 28-75mm f/2.8 Di III RXD Lens Version 3 Firmware Released ! Tamron today has released a new firmware update version 3 for the Tamron 28-75mm f/2.8 Di III RXD Lens. 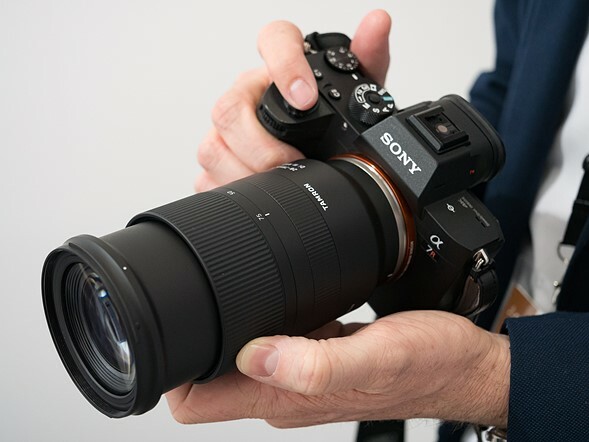 Author adminPosted on January 30, 2019 Categories Sony E-mount Lenses, Tamron FE LensTags Firmware, Tamron 28-75mm f/2.8 Di III RXD LensLeave a comment on Tamron 28-75mm f/2.8 Di III RXD Lens Version 3 Firmware Released ! 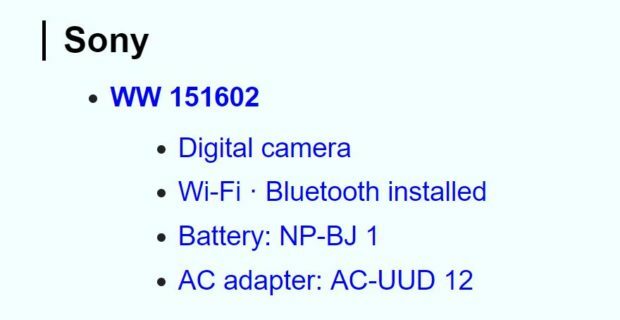 Sony has just registered a new camera code “WW151602”, according to Nokishita Camera, this camera will probably be the RX0 Mark II, to replace current RX0. The official announcement will be in next one or two months. Sony didn’t announce the silver version of Sony a6400 (B&H Photo, Adorama, Amazon) in US, but in Japan, you can pre-order silver Sony a6400 at Amazon JP. 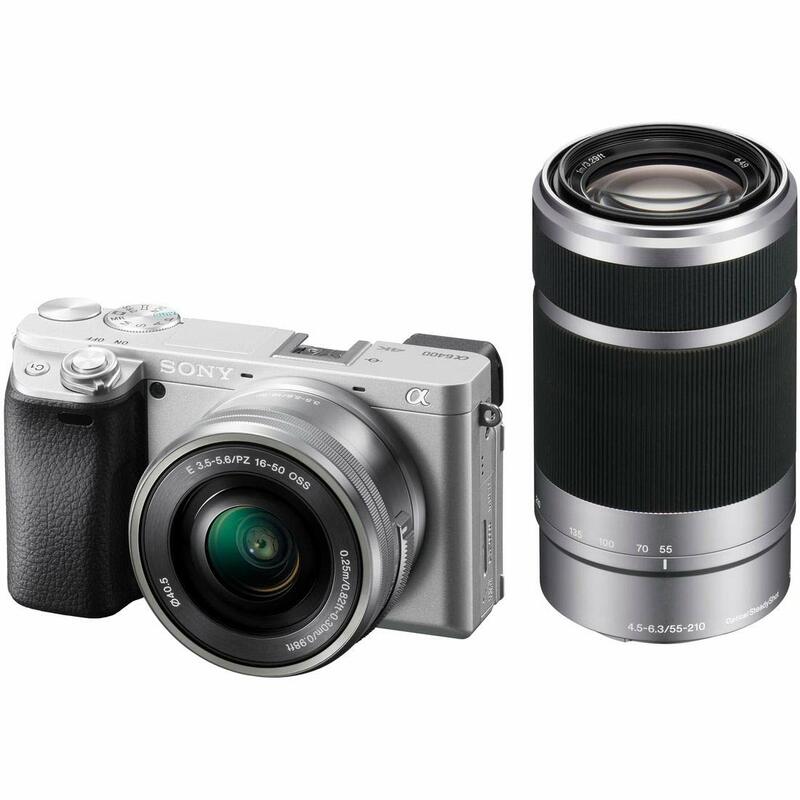 Maybe silver Sony a6400 will be announced later in US. After Sony a6400 (B&H Photo, Adorama, Amazon) announced in the mid January, next announcement from Sony is expected in middle or late February, just ahead of two large shows: CP+ Show 2019 (February 28th to March 3rd) and WPPI 2019 (February 27th to March 1st). Sony a9’s IMX310 Sensor Has 16 Bit, Global Reset Shutter, On-chip Dual Gain HDR 96dB DR ! The datasheet of IMX310 Exmor R sensor now has already leaked online. 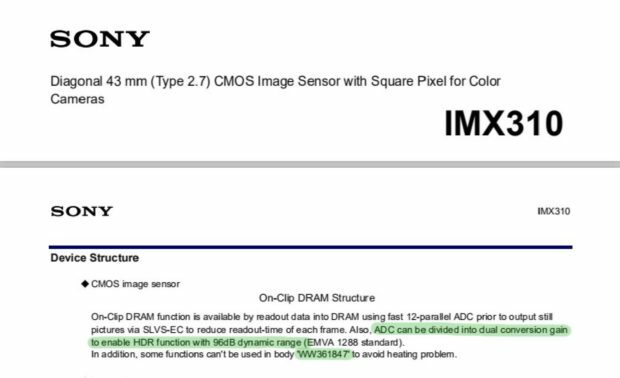 This Exmor R sensor has used on the Sony a9 (WW361847). From the datasheet, we can see that IMX310 sensor has 16 Bit, Global Reset Shutter, and on-chip dual gain HDR 96dB dynamic range. Author adminPosted on January 24, 2019 January 24, 2019 Categories Sony E-mount Camera, Sony NewsTags Global Shutter, IMX310, Sony Alpha a9 Deals/Cheapest Price, Sony Alpha a9 II1 Comment on Sony a9’s IMX310 Sensor Has 16 Bit, Global Reset Shutter, On-chip Dual Gain HDR 96dB DR ! Author adminPosted on January 21, 2019 January 21, 2019 Categories Sony E-mount CameraTags Firmware, Real Time Tracking, Sony Alpha a9 Deals/Cheapest Price, VideoLeave a comment on This is Sony a9’s Real Time Tracking with Firmware Version 5.00 !